ALCATRAZ: To Watch or Not to Watch? I don’t know if it was that Dexter and Homeland finished their seasons or if I finally reached my quota of Bravo reality shows, but I decided to set my DVR to tape the new TV drama, Alcatraz, appearing on the FOX network. With so little scripted dramas on network TV I was open to almost anything. Add in the fact that they advertised Alcatraz as a show brought to you by the creator of Lost and I was in. Even despite the fact that I considered the last two seasons of Lost a hot mess. So how did this new show fare? I give it four stars for creativity. It is nice to see a procedural that is fresh and not another reiteration of a successful show from the last decade. 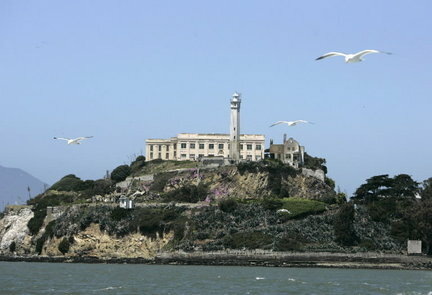 The concept, that when Alcatraz shut its doors in the early 1960’s the prisoners were never really transferred and all mysteriously disappeared, and are now showing up in modern-day San Francisco committing crimes, is a novel one. I like that I don’t know what direction the writers are going to go with this. I imagine, just like Lost, that they aren’t sure either. Shows like these are really about the journey and not the end, as we all learned with the disappointing finale of Lost. Having been to visit Alcatraz myself, I also was mystified by “the rock” and looked out at San Francisco from the observation deck. I thought to myself how strange it was that a huge city was just across the bay from one of America’s most notorious prisons. It was like waving candy in front of a child, but never letting them eat it. I do wonder how the average viewer will relate who hasn’t been to Alcatraz themselves. But, maybe the show will spark their interest enough that they plan their own trip to the bay area. I’ve heard that the show films in Vancouver and an exact replica of Alcatraz was built on a sound stage. Kudos to the set designers for making a realistic version. While I really like the concept of this show, there are definitely some serious weak points. The music is almost an exact copy of the Lost score. Is this subliminal messaging, just pure laziness by the producers, or a weak music budget? The dialogue was the biggest offender and it was beyond cheesy. I found myself saying several times, who is writing this? It seems that Sam Neill has the worst lines or maybe just his delivery of them is off. I really hope the dialogue improves because it distracts from the storyline. The third main character is Lost alum Jorge Garcia. Most will always remember him as the lovable Hugo, who worked at a fried chicken fast food restaurant and won the lotto. He is playing to type, but with a nerdy twist this time. It seems that the director or Garcia’s acting coach have warned him to play this role a little more serious. Sometimes, he seems just like Hugo and goes for the comic relief, but other times he seems like he is stretching and calling up a rendition of Hamlet in Central Park. I keep expecting him to walk into a scene holding a bong and say “dude”. But so far, all he has done is wince at the sight of blood and ogle his partner. All this leaves me with the most important question. Why did the writers find it necessary to keep denoting if it was present day or the 1960’s? Do they think the viewer is really that dumb and can’t discern the 1960’s from 2012? Here’s hoping they cut that out for the next episode. And yes, that means I am planning to watch the next episode. I’m willing to take another ride with J.J. Abram’s and see what develops.